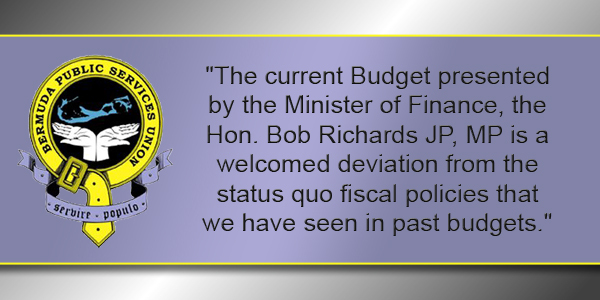 Introducing a new Financial Services Tax, payroll tax changes, and adjustments to customs duties were a few of the financial initiatives revealed by Finance Minister Bob Richards in the 2017 Bermuda Budget. In addition, the maximum taxable salary level will be raised from $750,000 to $900,000, land taxes for this upcoming year will remain unchanged, while duty on cigarettes, tobacco, beer, wines and spirits will be raised. In explaining the changes to the payroll tax system, the Minister said, “In the situation where an employer is currently passing on the maximum amount of 6% to an employee, an employee earning in the lowest band  will receive a tax cut of up to $600 p.a. in 2017/18. The Government will also be introducing a new tax to be called the Financial Services Tax which will be for banks, local insurance companies and Money Service Businesses. “When applied to banks the tax will be calculated as 0.02% of assets,” the Minister said. “The tax as applied to local insurance companies will be a tax on gross premiums earned, excluding premiums from health insurance. “The 2017/18 budget reflects the reality that the tax burden has not been equally shared in Bermuda for many years. The tax base needed to be broadened and I believe that is what the Minister attempted to do with the implementation of the Financial Service Tax. “There is still room for a further broadening of the tax base through the implementation of wealth taxes which target Bermuda’s rich, many whom receive large amounts of income outside of wages. “There have been repeated calls for a further reduction of the civil services. However, cuts have been made in a measured approach through early retirements and attrition. With eight consecutive years of Bermudians experiencing job losses, the last thing the country needs is a further reduction of Bermudians in the workforce. “It would have been unreasonable and irresponsible for the Minister to impose drastic cuts to the civil service during a period when our economy, while recovering remains fragile. “Civil servants have shared in the sacrifice and voluntarily took pay decreases for a two-year period to support the country’s economic recovery efforts; actions which are commendable. “Many Government departments are currently both understaffed and under resourced, despite the shortages, Civil Servants remain committed to providing quality public services. The Unions are also actively engaged with the Government on various public service reform initiatives to improve Government efficiencies. What he should be doing is apologising to the country for supporting the PLP during the years of excess which out us in this situation in the first place! With 8 consecutive years of Bermudian job losses, the Civil Service should have been cut back proportionately for each of the last 8 years. Government is the largest single employer in Bermuda. That is simply unsustainable. This is not about “a further reduction of Bermudians in the workforce”, it is about a reduction in Government employees and hence a reduction in Government spending. Why do you say that? If we can only barely afford to service our current debt, we must make drastic cuts in spending. If this were a mortgage, the bank would be looking at whether or not to repossess Bermuda! THE BOSS MAN AND THE MAIL GIRL. In this so called democratic society of ours, Hey ! that was never meant to be , equality has found no place here. Is there a difference between what a person’s wants and what a person needs to survive. What is the true value of another persons time ? Ability has allot to do with it , productivity is in there some where! Does he go to play golf at 2.30pm while she stays till 5.30pm to apply stamps. Both the Boss and the girl have equal responsibility because they are dependent on one another, as is the company they work for! No body really wants to know of the disparity , especially the Boss or the company. Would the Boss man care to swap places even for a day with his mail girl? Would the Boss man be happy to live on the same pay as the mail girl? Does the Bose man live a better life than the mail girl? They both pay the same price for fuel and power! The answer to most of these few questions and many more like them is most likely, NO ! So what is the the only resort left to the mail girl ? How many letters she gotta post that it takes her til 5.30pm to put stamps on them? Is it me or do these statements conflict one another???? I can assuredly say more people certainly is not the answer. As for resources, we need better rather than mlre to achieve greater efficiency. Why with a much smaller population and workforce do we need such a large Civil Service still? ‘ Vanz’ may be you missed the point its called disparity. Thousands and thousands of letters if she works for big business. Mail girls ( persons ) usually have other responsibilities. Not every on says “not my job”! They don’t lick stamps all day. Fill in as temp telephone operator. Some even make nice coffee.